Dentures are custom made in a dental laboratory from impressions taken of your mouth. With proper care and good oral hygiene, full dentures can last 5-10 years or longer. Over a period of time as your mouth naturally changes shape, dentures need to be relined, remade, or rebased. (Rebasing a denture means a new base is created utilizing the teeth on your current denture). There are two main types of full dentures, conventional and immediate. All of your teeth on your upper arch, lower arch, or both. Most of your teeth. 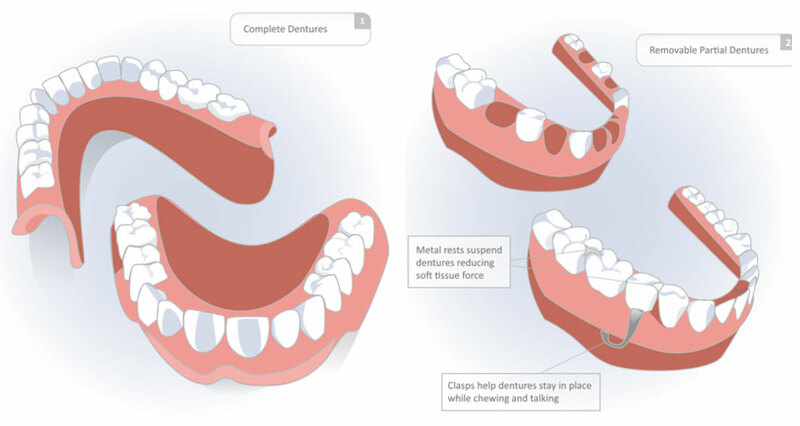 In this case, an over denture is fabricated to fit over one or more natural teeth or dental implants for support. Immediate dentures are inserted in the patient’s mouth as soon as any remaining teeth are removed. With immediate dentures, the wearer has teeth to use during the healing period. Oftentimes, denture wearers switch to conventional dentures when their gums have shrunk after the healing period. It is common that some oral surgery may be required to prepare your mouth for full dentures. Sometimes teeth must be extracted or the bony ridge of your gum must be improved to provide your dentures with optimum stability. A putty-like material is used to make an impression of your arch. Your dentures will be fabricated based on this impression. Sometimes a try-in appointment is required to fine tune the tooth color, shape, and to customize the fit. Dentures and oral tissues must be checked annually. Damage to oral tissue can occur without any pain or other symptoms. Early detection and elimination of inflammation is important to minimize shrinkage of the supporting bone and tissues. “I've been a patient here for many years. This dentist is fantastic! She has provided preventative treatments (covered by insurance) that I didn't know I had! She is also extremely personable and thorough! I highly recommend her!” - Julie M.